Mike VerWay has served as the Senior Pastor of First Calvary Baptist Church since December, 2000. Previously, he served in churches in Illinois and Michigan working with families, children, teens, and college students. In 2013 Mike received the Doctor of Pastoral Theology degree from Bob Jones University. Read his doctoral dissertation here. He and Brenda have four children. Mike loves preaching and interacting with people. 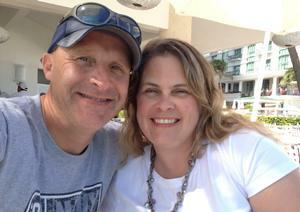 He is an avid fisherman, coaches youth sports, plays nearly every sport, and enjoys traveling. Mike came to faith in Christ at a young age and is the product of a Christian home and a great local church. He often quotes 2 Corinthians 5:21, "For He made Him who knew no sin to be sin for us, that we might be made the righteousness of God in Him." Chris was called to the role of Pastor for Adult Discipleship in December 2018. From 2015 to 2018, Chris served in the U.S. Air Force Reserve as a Chaplain Candidate; he currently serves as a Reserve Chaplain at Offutt AFB in Nebraska. He received his Master of Divinity from Bethel Seminary in St. Paul, MN. At a young age, Chris placed his faith in Christ alone for the forgiveness of his sins and was baptized in 2006. Chris enjoys traveling, soccer, cycling, coffee, smoking foods and reading. He and Katie have been married since 2008 and have four children (Sophia, Heidi, Bethany and Micah). Thad joined the church staff at First Calvary in November 2015 as Ministry Support Staff. He graduated from Bob Jones University in May 2014 with a Bachelor's Degree is Bible. He is currently enrolled at Southern Baptist Theological Seminary where he is working on a Masters of Divinity. Thad grew up in a Christian home and at a young age came to faith in Christ. He enjoys reading, podcasts, coffee, and adventure. Nikki joined the church staff at First Calvary with her husband in November 2015 as Music Coordinator. She was born and raised in Indianapolis, IN and is a graduate of Bob Jones University where she received a Bachelor's of Music in Church Music. Through the children's ministry of her local church, Nikki realized her need of Christ at the age of nine and experienced His saving grace. She enjoys reading, ice cream, and all things DIY.